Thank you for your interest in the National Student Exchange (NSE) program. If you are interested in finding out about NSE, please sign up for an information session. The National Student Exchange (NSE) provides opportunities for undergraduates to study for up to one calendar year at another NSE member college or university in the U.S. and its territories, including Puerto Rico, Guam, the Virgin Islands and some schools in Canada. With nearly 190 colleges and universities to choose from, you should be able to find a campus with just the right combination of courses, facilities and environment to meet your personal and academic needs and interests. Find out more at www.nse.org. To begin the application process, please visit the myCSUNglobe application portal. If you're an incoming NSE student who has been accepted to study at California State University, Northridge (CSUN), visit the Incoming NSE Students page. You must be a full-time student at your home campus at both the time of application and in the term prior to exchange. You are also expected to remain a full-time student while on exchange. To participate, you may be a freshman, sophomore, junior or senior. The National Student Exchange Program offers students who have a minimum GPA of 2.5 the opportunity to study at one of 190 schools in the United States for one or two semesters. You will receive 12 units per semester of transfer credit towards your CSUN degree. To find out more about the program, please visit the National Student Exchange National website and select the "Find A Campus" tab at the top. You can then select a state and research the NSE schools offered in that state. If you need to find out which schools offer your major, use the "All Programs of Study" filter and select your major from the drop-down menu. You may select up to five colleges to put on your application form. Students may participate in the exchange for a period not to exceed one academic year. The exchange may take place for one semester or one academic year. Q. I'm interested in the National Student Exchange (NSE) program. What should I do to learn more? A: If you have a GPA of 2.5 or above, please sign up for an information session. 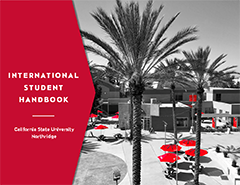 After attending an information session, please contact study.abroad@csun.edu or visit the International & Exchange Student Center, USU (opposite the computer lab) to set up an appointment to review your options. Q: What is the National Student Exchange program? A: The NSE program offers more than 190 different schools within the United States, its territories and Canada. Q: Can I study at another school in the U.S. for more than one semester? A: Yes, students can apply for either one semester or a full academic year. A: Yes, the minimum requirement for the NSE program is GPA of 2.5. Q: Is this competitive a program? Q: How do I apply to the National Student Exchange program? A: Come by the IESC and speak with Eleanor Wolgast. She will answer any questions you may have and review the online NSE application. You will need one faculty recommendation (which is part of the application form), your unofficial transcript from CSUN, the NSE application fee and the completed online application. Q: Can I go on the NSE program with a friend who is also at CSUN? A: Yes, you will apply as Linked Students. Your applications will be processed together for either your first choice college only or all the colleges on your list. A: Depending on which school you apply to, you can usually choose whether you pay CSUN fees, or the host institution's tuition fees. Transportation, room and board, and personal expenses will be your responsibility. Q: Will I still receive financial aid while on exchange? A: If you are eligible, you will continue to receive financial aid either from CSUN or your host school. If you are placed on Home Payment (Plan B), you will continue to receive financial aid from CSUN. If you are placed on Host Payment (Plan A), you will receive financial aid from your host school. If you are applying on Host Payment (Plan A), you must enter the FAFSA codes on your host school choices on your FAFSA application. Q: Can I participate in these programs as a graduate student? A: No, our programs are specifically for undergraduate students. Q: Will the classes I take while on exchange count toward my degree? A: Yes, you will receive transfer credit while on exchange in the NSE program. Q: Can I be a part-time student on exchange? A: No, all NSE students must be enrolled in a minimum of 12 units per semester. A: There is currently a nonrefundable application fee of $250. However, students can list up to five college choices on their application form.